Posted by Erin Weir under corporate income tax, media, Ontario, PEF, StatCan. We already have several posts about todayâ€™s front-page Globe and Mail story, but that wonâ€™t stop me from piling on. Andrew and Marc have noted that todayâ€™s story makes points familiar to this blogâ€™s readers. Indeed, posts questioning the alleged relationship between corporate tax cuts and business investment are almost too numerous to list. Jim, Armine, and I have all made the specific point that higher after-tax profits are padding corporate Canadaâ€™s â€œstockpiles of cashâ€ rather than funding investment. The latest Statistics Canada figures indicate that private non-financial corporations have stockpiled $456 billion of straight cash (Canadian dollars plus foreign currency). That total does not include cash stockpiled by banks and Crown corporations or near-cash items like short-time paper. Toby, Armine and Marc have posted excellent rebuttals of Stephen Gordonâ€™s response. However, I remember Jim prebutting this response four years ago. However, that in no way suggests that corporate tax cuts caused business to buy more capital. Lower taxes gave business more nominal dollars of after-tax profit, which have manifestly not been reinvested. But in an interview on Tuesday, [Ontario] Finance Minister Dwight Duncan said he supports Mr. Ignatieffâ€™s policy even though he himself is under siege by opposition members for presiding over corporate tax cuts. â€œThe feds could have actually taken their foot off the gas pedal in terms of corporate tax cuts because of what weâ€™ve done,â€ Mr. Duncan said. 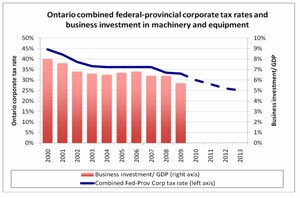 So, the purpose of provincial corporate tax cuts is to reduce the need for federal corporate tax cuts? Really? If Ottawa proceeds with corporate tax cuts, will Duncan take his foot off the gas pedal? The following graph that Toby and I prepared for Ontario looks pretty similar to The Globeâ€™s graphs for the whole country. One common point corporate taxes do not have the effects that many models suggest because investment is not tightly connected to return-on-investment. To what extent do taxes change behaviour, then? I can’t understand how the same points could be translated into discussions of other taxes or prices in common situations. On a related point, what is the optimal tax mix, then? Optimal corporate income tax rate? The posts point to 45% being tolerable, but when does it start to become a problem? Thanks, Donald. I will not claim to have pinpointed the optimal corporate tax rate, but believe that it is higher than any major political party is proposing. Restoring the federal rate to 19.5% (as proposed by the NDP) and Ontarioâ€™s provincial rate to 14% would provide a combined rate of 33.5%. Thatâ€™s a far cry from the tolerable 45%. What is the implication of high corporate income taxes on the form of investment? To the extent that investment is made from the stock of after tax profits and dividends are paid out of after tax profits then higher CITs may force a relative shift to investment financing out of bond sales. All things being equal bonds are a more expensive way to finance investment and investing in bonds is less attractive from a tax pov than dividends. Is this at all correct? I meant that if the corporate tax cuts were being criticized and the rate was about 45% before these cuts then it seems to suggest that 45% was not too high of a rate, that’s all. I’m not sure what tax mix is best myself, I’m a beginner. If it were a straightforward tax on the rich then I’d support raising it quite high. Donald, I think we are on the same page. Travis, a classic argument is that corporate income tax with interest deductibility favours debt financing (bonds) over equity financing (stocks). The higher the rate, the greater the preference for debt. In Canada, a countervailing factor is that personal income tax fully applies to interest income, but provides a dividend tax credit tied to the corporate tax rate. Finance Canadaâ€™s latest Tax Expenditures and Evaluations includes a paper on this question. Its conclusion is that the overall Canadian tax system is relatively neutral between different sources of corporate financing.